The Rev John Catlow married Grace Smith on 2nd April 1727, at Ashton under Lyne.  It is clear that Grace was a widow with maiden name Smith from a quitclaim of 1758, relating to the estate of her maiden aunt Alice Pickford. See http://discovery.nationalarchives.gov.uk/details/rd/6bbb8c80-90f6-4899-8955-078790fea14a. No signs of Grace's first marriage have been found. Grace Pickford was baptised on 30th January 1701 at Ashton, daughter of John Pickford and Catalina. John Pickford married Catalina Brewster on 8th May 1692 at Bromley in Kent. See here for the tracing back of the name Catalina. Grace was second of 9 children. John Pickford was a gentleman of the Old Hall, Ashton under Lyne, which Rev John Catlow later secured for his school. John Pickford was born on 24th August 1675 at Ashton and baptised there on 8th September 1675. He was son of Jonathan Pickford and Alice Lees. John died, apparently at the Old Hall in 1725 and was buried at Ashton in May 1726. Catalina apparently died in 1730. John was the first of 6 children. Jonathan Pickford was born at Pickford Hall in Macclesfield Cheshire, and was baptised at St Michael's Macclesfield on 2nd March, son of James Pickford and Grace Morewood. Jonathan was a gentleman of Alt Hill, Ashton, and married Alice Lees on 15th June 1671, having a marriage licence dated 10th June. They had also obtained an earlier marriage licence on 26th May 1670. Jonathan died on 20th April 1690 at Alt Hill. He left a will , which is at Cheshire Archives, but this is marked as too creased for filming. A note attached which has been filmed records the following: - James Pickford his grandfather as deceased, Alice Pickford his wife, Jeddedia his brother, James his younger son, James his father as deceased, Alice Williamson his mother in law, Priscilla, Alice and Grace his daughters, and his sister Ellin Fletcher wife of William Fletcher. He appointed as executors Robert Sandiford of Knotlands, John Corke of Hurdsfield, William Fletcher of Derby, and Alice his wife. This was dated 26th February 1689. Jonathan was the 10th of 11 children. His wife Alice Lees has been stated as heiress of her mother's will. Alice was daughter of John Lees and Alice Bardsley. Alice Bardsley was baptised on the 2nd August 1618, daughter of Alexander Bardsley and Jane Knott. Alice left a will, which has not yet been obtained. James Pickford and Grace Morewood married on 19th June 1639 and Bradfield in Yorkshire. Grace was daughter of John Morewood of the Oaks, Bradfield and Grace Hunt, baptised at Bradfield on 8th December 1616. 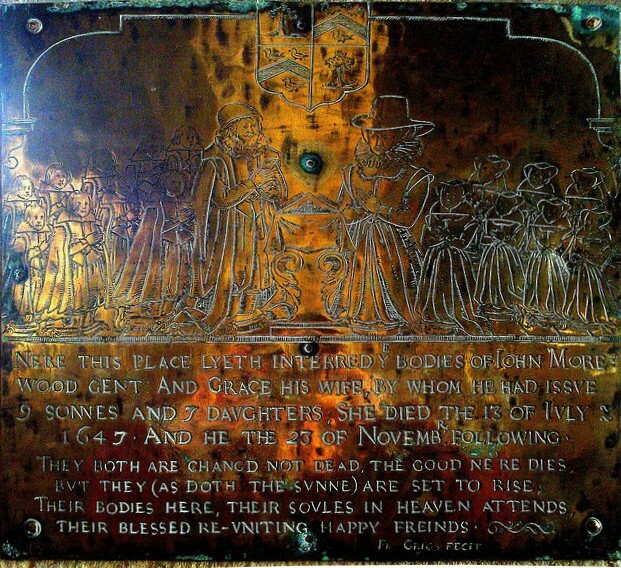 See the Morewood memorial brass below. James Pickford was baptised on 4th May 1617 at Macclesfield, son of James Pickford and Ellen Hordrone. He was a gentleman and alderman on the council. James was buried at St Michael's Macclesfield on 4th July 1666. His will may be seen here. He was the third of three children. Grace died in October 1687 - described as 'late of Macclesfield', and was buried at St Michael's on 28th October 1687. James Pickford married Ellen Hordrone on 16th January 1610 at Prestbury. He was born at Bollington and baptised on 19th June 1584 at Prestbury. He was the son of James Pyckforthe and Margaret Hollynshed. He was the first son of three. James and Margaret married on the 30th January 1575/6 at Prestbury.